Barcelona were sitting on top of the league, ahead of Atlético Madrid by seven points as they took the field at Villareal’s Estadio de la Cerámica. The so-called Yellow Submarine have been pretty abject this season, with relegation a possibility for the inconsistent, canary-colored team. Barça played three days ago in la Liga’s return from the international break, and Messi bagged a brace to beat Espanyol 2-0. The continuing rivalry with Espanyol is the longest in the club’s history–even dating back to the antecedent team “X SC” that was absorbed into the current RCD Espanyol a hundred-years ago. Beyond the historical grudge, a modern contempt for Espanyol and the area of Cornellá they play in, makes the local feud ever-snarling and spiteful. The game was the kind of sleepy, low-gear affair that is so frequently seen after an international break. Messi finally snapped it into gear with his subtle free-kick in the seventy-first, before he put it out of reach in the eighty-ninth. Job done; Welcome back. With a game to come against Atlético on Saturday, followed by the first Champions League quarter-final in a week against Manchester United, the rationale of resting the most crucial players made sense. Villareal currently sit in seventeenth place, just two points above the drop zone. This is a surprisingly poor season for the team that has consistently qualified for the Europa league since returning to the first division, five years ago. As the game started, both teams began a relentless punch, counter-punch rhythm that seemed destined to result in goals. Umtiti and Lenglet were lethargic and routinely beaten and saved by Ter Stegen’s interventions. The shaky start notwithstanding, Malcom managed to bomb forward into the right wing, finding Coutinho who scored a tap-in to make it 0-1, Barça. Two minutes later, it was Malcom’s turn to score off a headed cross to the box courtesy of Arturo Vidal. 0-2. No Messi, no problem…? However, Villareal responded to the deficit by solidifying in the midfield, keeping nine or ten behind the ball as they tried to neutralize the width that Malcom brought to the Barça attacking line. Sure enough, the resurrected Santi Cazorla found Chukwueze on a break, and the Nigerian Super Eagle filled the back of the net after leaving Jordi and Lenglet in a panic, fresh from having their naps interrupted. Though Coutinho seemed assured in spurts, scoring first and then rattling the post, he still gave up possession several times and struggled escaping the usual cul-de-sacs in the final third. Malcom on the right, held to the Guardiola-esque idea of hugging the touchline to drag defenders out wide where they would leave central space that could be exploited. Into this space, Arturo Vidal stormed from box to box, just ahead of Sergio Busquets who had a dreary performance by his elegant standards. 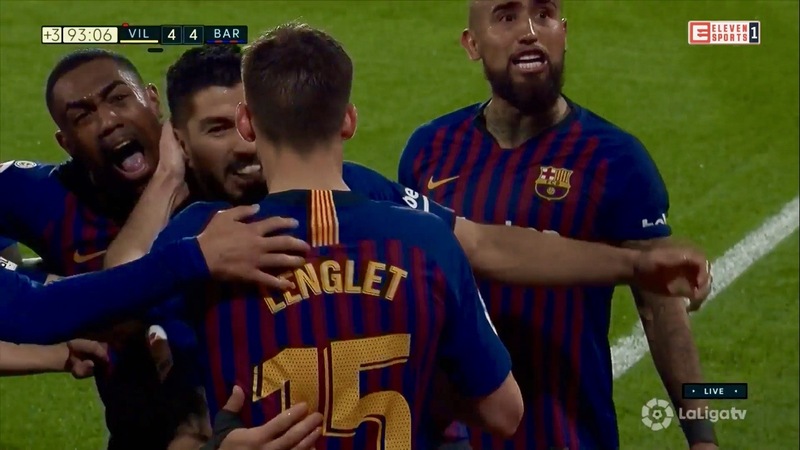 In the back, however, Lenglet and Umtiti looked leaden and lacking organization without Pique. Up front, the engines stopped humming and the first half ended. In the second half Villareal took some initiative and Toko Ekambi broke loose off Chukwueze’s ball forward. He drove to the box, beating Lenglet and an impotently sliding Umtiti. As Ter Stegen stepped forward to brace for a cross to the arriving Iborra at the penalty spot, Ekambi exploited the German’s gamble and perfectly slotted the ball into the lung of the goal. 2-2: Even Steven. Messi warmed up and came on for Coutinho. The diminutive magician was barely on the pitch before Villareal went ahead through Vincent Iborra in the sixty-second minute. Would Valverde replace one of the struggling French defenders? No. Instead the manager brought Rakitic and Aleñá on for Busquets and Arthur ten minutes after going behind 3-2. Interestingly, Malcom stayed on for the full ninety minutes, showing some faith in the under-utilized winger ahead of Coutinho. In the eightieth, Carlos Bacca jogged his wobbly ancient body, skating around Ter Stegen and slotted past another useless dive from Umtiti to make it 4-2 for the Yellow Submarine. How would Barça respond to going down two goals with ten minutes left to play? There are memories of Messi hanging his head, dejected and disinterested in games where they’ve been behind. The ghosts of under-performing springtimes past. Tata Martino rattling his chains in the nightmares of another season. But there are other responses we’ve gotten used to. Where the team refuse to die humbly, and instead draw from an intense inner drive to compete. Today, it was Messi taking a free kick in the ninetieth minute from just outside the box–his recent killing spot. The ball cannoned to the inside of the post and bounced in the net beyond the diving reach of keeper, Sergio Asenjo. 4-3, with only extra time to play. With three minutes left to try to “steal a draw,” Barça dominated possession in attack again and tried to break down the ten-man defense of Villareal, who’d lost Gonzalez to a red card in the eighty-sixth. A corner went to Barça in the final breaths, Messi seized the ball to deliver it high and to the far end of the box where Suarez found it and volleyed it into the goal, sending it beyond Asenjo–diving this time the other direction from where he’d just been beaten. 4-4. Whistle blows. Barça have not been beaten in any competition since January 10, in a Copa del Rey first leg against Leganés. They haven’t lost in la Liga since November. Even at their shakiest–as they seemed to be for an hour of this contest–they still look like a team that has learned the resilience to hold their nerve and not be beat. Not a win, but one of the games of the season.